I lost my first daughter, my first child at 8 weeks of age to SIDS and then 13 years ago my husband passed away while I was 6 months pregnant with a very unexpected blessing and 3 other children at home. I don’t think I will ever stop grieving the lost of my daughter. Suddenly the saddness comes upon me now even 32 years later. Interestingly though, I feel my husband’s presence quite frequently. My son serving a mission says he’s been aware of his father at times. We went on a family vacation to Florida, my husband’s favorite destination. The kids remarked through the entire week that they knew dad was along for the fun and it was the best vacation ever. I think we need to realize everyone needs something different as they grieve. I am a private individual. I shoulder on with the work I have to do. I needed peace and quiet to grieve when my husban died and it was very difficult because I didn’t get it. I just had a hard struggle when my daughter passed. I was so distraught and I don’t know how to explain it but there was such and emptiness in my life. I think it was just hard and I don’t think anything would have helped much but eventually the pain dulled and life was more bearable. I think it would have helped me immensely when my husband died if people would have taken a greater interest in helping my kids. I didn’t need another casserole but I would have loved for people to invite my kids to a movie or swimming or just occupied them while I sorted things out. It was so difficult to be pregnant (and 41) with a 16, 12, 9 year old, a newly formed business to worry about and my own grief. It was almost overwhelming but once again we managed to get through it. I ask people, “If someone could do something to help you right now what would it be?” If I can’t do it I try to find someone who can. Just remember people grieve differently and we should never judge them or tell them “it’s time to move on.” It just doesn’t work that way. Wow…today is the 8th “anniversary” of our son’s death, his Angel Day. Interesting timing. It is hard. We do all grieve differently. I used to avoid people at the store because that was not a convenient place to break down and cry. You don’t want people to forget them. I have a brother that lost his daughter over 20 years ago when she was 6 months old. I still don’t know what to say to him. I have friends that have lost children–one lost two, a 4 month old and a 14 year old. Saying things like, “I understand what you are going through” doesn’t really work, even when you have been through it, because it’s so different for everyone. But there are similarities, all the same. To this day, I don’t know what I want to hear from people. I think the most comforting thing is to hear others’ memories of him. Sometimes I hear something new, even years later. I am so grateful to know that I have one child of my 12 that has made the celestial kingdom. It has made some of us want to work harder to get there. It has created a situation with my 16 year old, who was only 8 then, to be inactive and not sure she believes in God. Another child turned to drugs to deal with it. It’s really hard to be grieving yourself, your eternal companion is grieving with you, and to have 8 other children to try to figure out how to grieve and work through it. I don’t think I did a very good job at that. I think it would have been helpful to have someone else that was close to my children to help us through that. Counseling didn’t help us. We don’t have many close friends that could step into that role, either. I’m grateful for the atonement that will heal all wounds, even if not in this life, and make it all right for each of us. My advice on how to help? Follow the spirit! Pray for guidance. One day the person grieving needs one thing and the next day that wouldn’t help…so just follow the guidance of the spirit to know how to help. Now to have the courage to read this book. It sounds good….something I’ve thought of doing myself, but haven’t had the courage to. I too would love some ideas of what to do to help others. I just wanted to comment about what you said about what you could and could not handle. I think we are all stronger than we think. When a situation comes up that we never thought would happen and that we don’t want- we deal with it and learn from it. It’s hard and sad and awful, but somehow (with lots of help from HF) we make it through. He gives us the strength we need, Others step up and mourn with us and comfort us and we grow. The pain is often unbearable. But we are strong. The saddest funerals I have ever been to were the 3 for infants. It just rips your heart out. My brother lost his first child at 9 weeks to SIDS. I was a senior in high school and remember how devastated he was. (Our whole family was.) It’s been 23 years and he says the same things some other commenters have–he loves to hear that Katie is remembered. Last year he asked all of our siblings to write what remembrances they had of her and her passing. It was a good exercise to reflect and remember all the love that was poured out on that little girl during her short life. One of my memories was the testimony my brother bore to our family at her graveside. That was the experience that made the Plan of Salvation very real to me. Really the best thing to do is tell them how sorry you are for their loss. DO NOT say “let me know If there is anything I can do”. Pray for guidance and just do it . Also, don’t avoid talking about the one that has passed. They want to talk about and remember their loved-one. Thank you for that very nice review. 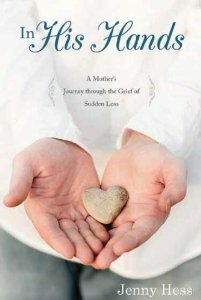 I wrote the book mainly for me and my family, but felt that the things that I learned through the grief of losing a child might be helpful to others. From all the other commenters we can see that there are far too many people out there who have lost loved ones. And while we all grieve differently, we all seem to experience many similar emotions. I understand sadness, depression, anxiety, anger, and the beauty of the Atonement so much more personally and deeply now after losing Russell. Two simple things that were life saving to me: 1. A basket for the cards-we got so many, and I couldn’t read them right away. I collected them in the basket, safe and sound, until I had the courage and strength to go through them. And 2. A small, purse-sized notebook to write things down in. I was in such a fog for a long time. I couldn’t remember things, and memories of Russell would pop up in my head. That notebook was a place I could write down everything (instead of scraps of paper that would inevitably get lost!) and know I could find them later. And just like the rest of your commenters have said, a simple message of, “I’m thinking of you” or “I remember” are always nice to hear. Father’s Day is coming up, do you know anyone (like the first commenter, Regan Butler) who could use some kind words? Remember, special days (I LOVE that “angelversary” Ziff130-I’m going to have to use it!) are especially hard for those of us who are missing someone. Grief is an interesting and difficult emotion. We lost my grandparents suddenly when I was 13. I would in no way compare that to the loss of a child or spouse, though it was difficult. Our first child had an emergency surgery at 1 month old. We weren’t sure for about a week if he would live or join Heavenly Father, and though he remained here in mortality, (with two years of surgeries and a colostomy) I do remember that fog of not knowing what to do or what I needed. I think that may be true of others who are grieving….sometimes you just don’t even know what you need, the fog is so thick. You are reminding yourself to breathe and eat and change your clothes and get out of bed. I was so very grateful for those who just jumped in and did something…things I didn’t know I needed. Someone stocked the refrigerator with easy to eat things. Someone paid our rent. Someone else did my laundry. Some just came over and let me cry on their shoulder and held me. I didn’t have other children, but taking some of the motherhood burdens over would have been a definite help…especially helping them to sort through their own emotions if as the mother, I couldn’t do it. I love your ideas of remembering them on their special days. I will add that to my list of helpful suggestions. And I find most people, after a little time, do want to talk about their loved one and the memories they have. And even though things do improve with time, there will still be days where memories come forward or dreams and wishes pass by unfulfilled in which grief will be relived and that’s OK, no matter how much time has passed. A family that we did not know very well. It was the parents of one of my daughters friends came and prayed and cried with us. They stepped out and were vulnerable and true even though they never lost a child. It is something I follow…I go and pray with strangers who have lost children. It has become intertwined with my own healing.